Because we could never have too many of them. So Douglas Laing are having a new Springbank, and this will give me a good excuse to first have an older official that I’ve always wanted to try. Let’s have that one as the apéritif if you don’t mind. And then perhaps a bonus ? Not the pear-shaped bottles. Just to make sure, this was charmingly (and quite pleonasmically) labelled as ‘100% pure malt’. Better make your point. Colour: straw. Nose: well, many older Springbanks were sherried, and this one may well have a wee bit of sherry inside as well, but otherwise it’s totally pure indeed, extraordinarily camphory, waxy, full of fresh marzipan, argan and pumpkin oils, petroly oils, old musty magazines, coal tar, soot, chalk, and then grapefruits as a joyful signature. Fantastic distillery character, full and complex at the same time. Mouth: of course we’d have preferred 46% vol., but this distillate was so rich and characterful that it needed no extra-punch. Wonderful bitterness, almonds, tar, smoked meats, lemon curd, paraffin, a feeling of blue ink (why blue, S.? ), salted chocolate, and then a wee mezcaly agave-iness. Finish: rather long, with rather more mint and aniseed, a touch of good rubber (very Springbank), and that typical salty aftertaste. I’ve heard they were adding seawater to the barrels just like they were doing at Bowmore – just joking. Comments: loved the aniseed in the finish. Mind you, a ten years old at 43% vol.! A brand new one! 1996’s 21 yo XOP had been extremely good, albeit a bit too sherried for me (WF 88). Colour: gold. Nose: ooh, these mentholy and pine-y smells that I cherish so much, this soot, these subtle fermentary touches (pot ale), this grassy smoke (beach bonfire), these green cigars, Indonesian-style, this bag of last year’s cider apples that someone forgot to let ferment, and all this cut hay… With water: raw wool, wet dogs (we shall remain friends forever, dogs), candle wax, soot… Mouth (neat): it’s an IB that’s pretty close to the OBs, and in truth rather more to Longrow than to Springbank, or say midway between both styles. Big notes of lemon icing, grass, green tea, cough medicine, then rather fresh coriander, concentrated lime juice (for quick mojitos)… My my. With water: exactly what we were hoping for. Wax and citrus in perfect sync. More Springbank than Longrow this time. Finish: long, rather dry and pretty bitter, calling for more. Lemony waxes and oils, with a salty tang in the aftertaste. Comments: what’s most striking is that this is very close, as far as styles are concerned, to the old 10 that had probably been distilled in the 1960s. Product substance over brand content, as they’re now saying at marketing seminars. It looks like once again, I won’t make it to Limburg this year. But I’ve already got some ‘Limburg’ Springbank on the tasting desk, which ain’t half bad, even if these vintages could sometimes be a tad unlikely… Colour: pale gold. Nose: indeed, it’s one of the ‘funnier’ one, with notes of turnips, hand cream, oysters, stewed rhubarb, guava juice, Weissbier, rose petals, even litchis… We’re far from the sooty and mineral ones that they started to distil a few years later, even if it’s easily noticeable that it tends to get better focussed after a few minutes. This baby needs air. With water: brilliant, all it needed was time and a little water. Crushed chalk in seawater and lemon juice. 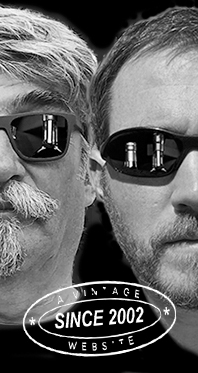 Mouth (neat): ah wait wait wait, this is different indeed. Chalky lemons, citron liqueur blended with seaweed juice, thyme and rosemary, these wee ‘plasticky’ notes that weren’t uncommon in Springbank back then, graphite oil… With water: we got it! Chalky textile and lemony brine, tinned sardines… Finish: medium, and rather beautifully paraffiny and almondy. Comments: what a come back! 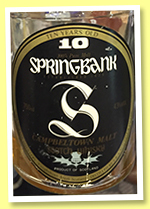 A very interesting Springbank that one should add to any proper verticale.